Waco Survivor Stories - True of False? Waco Survivor Stories — True or False? This image (without caption or photo credit) decorated the main page of "Waco standoff: Remembering the Branch Davidian siege 25 years later," a retrospective series of articles on the Waco Holocaust in The Dallas Morning News, February 27, 2018 (cached). From the image of the Mt. Carmel Center burning in the background, we are led to presume that these are Davidians escaping the fire on April 19, 1993. But there were no contemporaneous photos of Davidians escaping that day. In real life, would escapees from a fire — who may be suffering from burns and smoke inhalation — be expected to walk a half mile with their hands in the air? And what of the other fire victims who may not be able walk or breathe well enough for the trek? Where are the firemen and the emergency teams? Appearing 25 years after the event, this is an obvious piece of fake news -- or more exactly, fake photography. Poorly done, even for government work! No wonder the originator did not want to take credit. If there had been a true photograph of fire survivors, that picture would have been well-published at the time and iconic to this day. The News would have re-published it on February 27, 2018 with full caption and photographer credits. Each survivor would be identified. This obviously fake image is a confession by The Dallas Morning News that there were no such photos taken on April 19, 1993. The September 9, 1999 edition of Salon magazine carried a story written by Branch Davidian David Thibodeau, whom (we are told) survived the April 19, 1993 inferno at the Mt. Carmel Center in Waco. Among other things, David T. discusses that fateful day. Can we rely on David Thibodeau's account of the events of April 19, 1993? Please read the following and come to your own conclusions. I see two major problems with Mr. Thibodeau's account(s): (a) important elements in his accounts keep changing, and (b) none of the accounts are credible. Some history: By the summer of 1995, the news of how the mothers an children died in the Mt. Carmel center had made the rounds in the Waco protest movement: The moms and kids had hidden from the CS in an old concrete records storage room that was being used as a pantry in 1993. Instead of protecting the moms and kids, the concrete room became their tomb. The story worried me from the beginning. Mothers are practical people. When the air is poisoned, the practical solution is to get away from it. But the concrete room was a catch basin for poisoned air. It was windowless. It had a doorway, but no door. Poisoned air entering the room from the doorway would have nowhere to escape. Why would the moms take their babies to a catch basin to escape the CS? I wanted to know more. So in July, 1995 I interviewed David Thibodeau on the telephone. I asked David T. whether he had seen the mothers and children on April 19. First he said no. Then I asked who told the mothers and children to go to the concrete room. He said he did not know. However, he confirmed that the mothers had gas masks and the children had no gas masks, so to protect the children, the mothers had buckets of water and cloths and with them; the mothers dunked the cloths into the buckets of water and covered the children's faces with wet cloths. But how could David Thibodeau know what was happening in the concrete room if he had not seen the mothers and kids that day? I asked him. Now he said that one of the mothers came out of the concrete room and told him what they were doing. I asked which mother came out: He said he did not remember which mother. It is curious. First David Thibodeau had not seen any of the mothers, then he had, but couldn't remember which. How likely is it that? There were a limited number of mothers--friends and co-religionists with whom he had lived for years. One of the mothers inside that room was Michelle Jones, David Koresh's sister-in-law, the woman David Thibodeau says was his wife. With Michelle were her three children--two-year-old twin girls and five-year-old Serenity Sea Jones. Since he remembered the incident, and given his personal interest, we might expect that David would remember which mother had spoken to him. Some time after my telephone interview, I came across an article, "Marked for Death," published in The Jerusalem Post, October 14, 1994. Reporter Haim Shapiro interviewed David Thibodeau while he was visiting Israel. He tried to reach the children--whom he believes were in a buried bus [emphasis added] which the group had prepared as a shelter--but with stairways wrecked and sheets of flame all around him, it was impossible. He staggered out the door and looked back to see Mt.Carmel totally ablaze. "I knew that my friends were dying and I only hoped the kids were safe in the bus." Here is a diagram of the Mt. Carmel Center. Note in particular the locations of the buried school bus and the concrete room (called "cinder block" in this diagram). Very different places. "It remains hard for me to clearly remember what happened after the tanks made their move. Walls collapsed, the building shook, gas billowed in and the air was full of terrible sounds: the hiss of gas, the shattering of windows, the bang of exploding rockets, the raw squeal of tank tracks. "There were screams of children and the gasps and sobs of those who could not protect themselves from the noxious CS." But remember that according to David Thibodeau's earlier statements, the children were in the concrete room (or the buried school bus). How could he hear their screams and gasps and sobs since he was not there? "… the hiss of gas, the shattering of windows, the bang of exploding rockets, the raw squeal of tank tracks." Let us look at what we are being asked to believe. 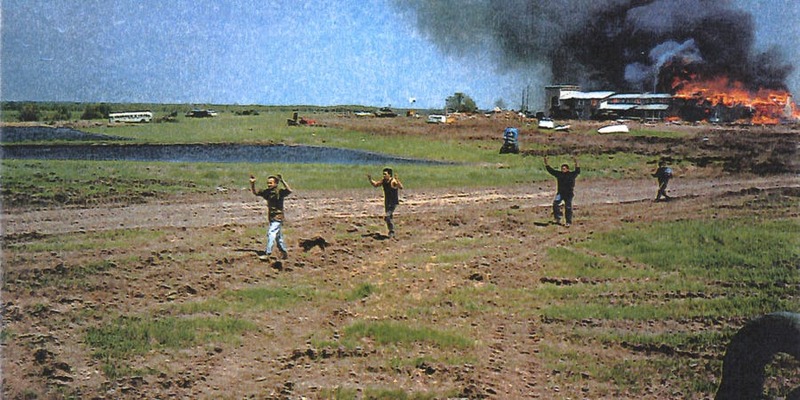 That on April 19, the day of the CS and tank attack, the Branch Davidian mothers and children were herded into a catch-basin for noxious air, and abandoned to their own devices. Despite hearing their screams and gasps, the men, including David Thibodeau, whose own wife and step-children were there, never checked in on them, even though their agony went on "for hours." And apparently, to David T.'s knowledge, none of the other Davidian men checked on the mothers and children either. And we are asked to assume that inside the concrete room the moms (who had gas masks) were holding onto the children (who didn't have gas masks), covering the kids' faces with wet cloths while the kids spluttered and gagged and writhed in their death throes, but the mothers' nerves never snapped. The moms didn't dream of getting up and running out of the gas chamber with their babies. The story is not credible. In order to believe that story, we would have to believe the Davidians — both the menfolk and the mothers — were callous, monstrous people, and I see no reason to believe that. "Inside Mount Carmel, the notion of leaving seemed insane; with tanks smashing through your walls and rockets smashing through the windows, our very human reaction was not to walk out but to find a safe corner and pray." Well, all right. If the concrete room was so safe, why wasn't David T. there too? "As the tanks rolled in and began smashing holes in the building and spraying gas into the building, the FBI loudspeaker blared, 'This is not an assault! This is not an assault! "Around noon I heard someone yell, 'Fire!' I thought first of the women and children, whom I had been separated from." David Thibodeau became "separated" from the mothers and children? That implies he was with them at one point that morning, but he told me he had not seen them (except for the one mother whose identity he couldn't remember). On the other hand, David T. did not tell the Jerusalem Post about being "separated" from the mothers and kids--he just thought they were in the buried bus. David Thibodeau escaped the CS and the fire, and did so very well. Neither he nor any other of the "fire survivors" needed treatment for smoke or CS inhalation, yet all the moms and kids died. I remember the Branch Davidian men as protective of the women and children. Recall Wayne Martin's words during his 911 call on February 28, 1993: "We have women and children in here. Tell them to call it off!" Or David Koresh's words at the front door on that same day: "Now hold on! We have women and children in here!" "What could I have done differently?" or "Why didn't I check in on them?" or "Why didn't I keep them with me?" and "Why did they die, and why did I live?" But six and one half years after the event, not one of the fire survivors has publicly made such an utterance and re-examined a most callous and uncaring action: sending the moms and kids to a dead air cul-de-sac on the day of the CS attack, never once checking on them, running out of the burning building themselves … and letting the mothers and children die. The Autopsy reports present even further problems with David Thibodeau's account(s). Surely the Davidian survivors, their families, and their lawyers have looked at the Autopsy Reports, yet they never have raised one question about the anomalies in those reports. For example, whose child was Mt. Carmel Doe 51A? The skull of this two year old was found in the concrete room, but it has not been identified. Is it likely that one of the Davidian mothers had a two year old, and no one noticed? Hardly. What about Doe 65 (remains of a two-to-four year old), Doe 31DE (remains of a 11-14 year old) ,and Doe 59 (remains of 14-19 year old Caucasian girl.) If these were Davidians, why have they not been identified? And if those people were not Davidians, who were they, and how did their bodies come to rest in the concrete room? And why are the Davidian survivors, their families, and their lawyers not talking about the bodies that are entirely MISSING? Where on earth could those bodies be? For more information, see Identification of the Remains. Look at the quadruply amputated and beheaded body of John McBean, Doe 32.
or the sawn off arm of Mary Jean Borst, Doe 45. Surely even the most ardent atheist deplores the defilement of human remains. But the Branch Davidians are quiet. Yes, there is something very wrong with the survivors' accounts of what happened on April 19, 1993, and their reactions to those events. Without the survivors's stories, our attention would be focused on the evidence, and the evidence SCREAMS that the mothers and children were murdered with malice aforethought. The evidence SHOUTS that their bodies were laundered--mutilated, decapitated, blown apart, and selectively burned--to disguise the time, cause, circumstances, and even the identities of the dead. But the survivors stories divert or attention from the evidence. We are so horrified by events that as decent, caring people, we can only offer solace. We would never dream of questioning their word. We never notice the survivors' stories and the government's story are one and the same: The US was only trying to get the Davidians to come out that day, when, ooops!, the mothers and children got dead. Without the survivors' stories, no one would believe the government's tale. The unbelievable stories of the Waco "fire survivors" are essential elements in the cover-up the Waco Holocaust.